Second-half goals from ArdaTuran and GerardPiqué gave FC Barcelona a thrilling, 2–1, come-from-behind victory over Borussia Mönchengladbach in UEFA Champions League play on Wednesday night at Borussia-Park. The late heroics snapped Borussia's 11-game home winning streak and gave goalkeeper Mark-André ter Stegen — who was facing the club where he spent his entire life, from age four until he joined Barça in the summer of 2014 — a homecoming to remember. 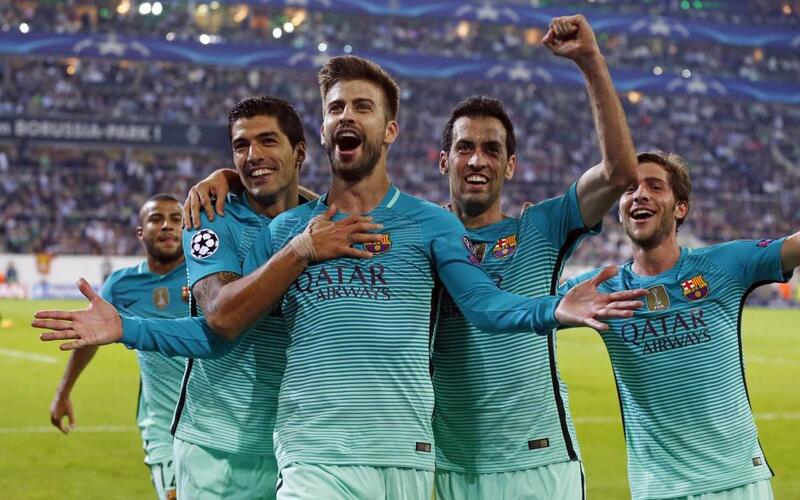 The victory is Barça’s second in as many games in the group stage. The Catalans continue to lead Group C, and have now scored nine goals and conceded just one in the two games combined. But despite their perfect record and their eye-popping goal differential, a mere 45 minutes before Wednesday night’s final whistle, their front-runner status was very much in doubt. Trailing 1–0 at the start of the second half, Barça came out of the intermission to see the Germans ditch their aggressive — and successful — first-half stategem in favour of a full blown defensive approach, setting up a two-line, phalanx-like platoon intended to neither bend nor break. Barça manager Luis Enrique Martínez countered, first by bringing in Rafinha to replace Paco Alcácer — who had started in place of the injured Lionel Messi — and then, at the hour mark, by swapping out Ivan Rakitic in favour of ArdaTuran. Shortly thereafter, the moves paid dividends. In the 65th minute Barça tied the game when Neymar found Turan in the Borussia area and the Turkish international volleyed off the bounce, sending the ball into the goal with such force that the metal stake used to hold up the upper rear corner of the net produced an audible rattling noise that was instantly juxtaposed against the abrupt silence of the suddenly deflated home crowd. Then, in the 73rd, after Suárez left his feet to rocket a 17-metre volley — the shot was so potent that although it went straight to the keeper, it was much too hot to handle — Piqué, sandwiched between a pair of defenders, cleaned up the rebound to give Barça the lead. The sure-handed TerStegen faced no other serious tests as Barça became the first team to win at Borussia-Park since 23 January. The first half, though, was another story entirely. Exceptional scoring chances on seven and 11 minutes by Neymar and Suárez were among the few outliers in an otherwise soporific opening quarter hour, during which both teams played risk-averse football resulting in a paucity of menacing incursions. Barça had yet another chance to open the scoring in the 21st minute, when a steal deep in Borussia territory gave them a 2-on-1 in the Borussia penalty area. Suárez, however, passed up an open shot from a 45-degree angle, and his attempt to set up Alcácer on the doorstep was one touch too many and was swept aside by an alert defender. Borussia took the lead in the 34th, when they pounced on an uncharacteristic turnover by the Barça midfielder SergioBusquets, leading to a lightning quick counterattack and an elementary finish by ThorganHazard, who steered the ball with ease past the helpless TerStegen. Five minutes later, Suárez had the equaliser on his foot but his cleanly struck volley from close range was adroitly parried by Borussia goalkeeper Yann Sommer. Barça continued to push hard for the tying goal, but they would go into the dressing room at half-time knowing that a second-half turnaround was the only way to save the night.